RIM recently announced two new BlackBerry smartphones, the BlackBerry Bold 9790, a QWERTY phone, and the touch screen Curve 9380. Both phones run on the new BlackBerry OS 7. The BlackBerry Bold 9790 has a 2.45-inch touchscreen display with 480 x 360 pixel resolution, a 1GHz Marvel Tavor MG1 processor, 768MB RAM, 8GB internal storage, 5 megapixel camera with VGA video capturing and a microSD card slot. For connectivity options, the Bold 9790 has Wi-Fi, 3G with HSPA, GPS and NFC. The Bold 9790 comes with a full QWERTY keyboard and an optical trackpad. The BlackBerry Curve 9380, on other hand, features a 3.2-inch screen ith 480 x 360 pixel resolution. This is the first Curve phone to feature a touchscreen. The Curve 9380 features an 806MHz processor, 512MB RAM, 512MB internal memory (expandable via the microSD slot), Wi-Fi, GPS, 3G with HSPA and NFC. The Curve 9380 features an optical trackpad but it doesn’t have a physical keyboard. 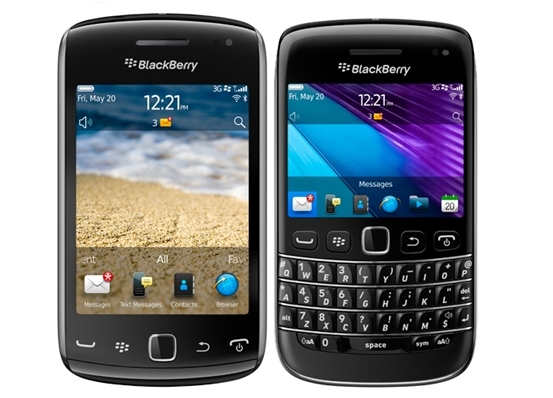 The BlackBerrry Bold 9790 and Curve 9380 will be available in the next couple of weeks. Nice phones. Looking good.But in market lots of mobile phones are available.You can go for next i you want some more quality & feature.Well the post in good & informative.Keep it updates. Curve 9380 price is affordable but specs have been downgraded. processor only 800 MHz, killing autofocus on the camera, and reducing the screen quality. Get this phone only if you are on a tight budget.